An excellent Video WordPress Theme aimed to create beautiful and clean video portals for sharing videos and monetizing your content, with a legendary drag and drop layout builder, tons of theme options and layouts. 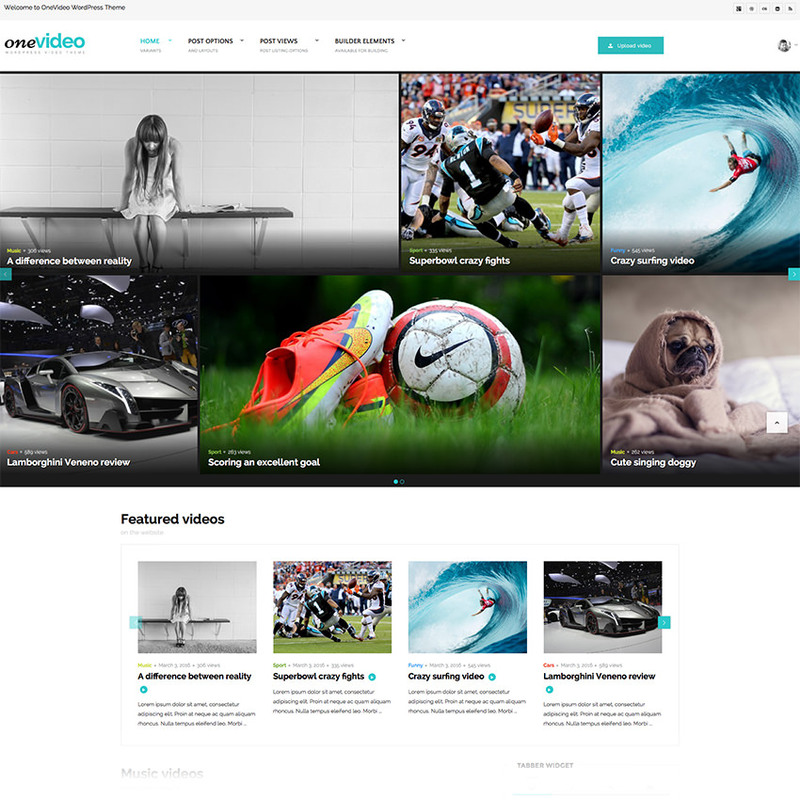 Onevideo is a clean and modern Video WordPress Theme that makes it easy to add videos and even let your users add their own. This beautiful WordPress theme comes with tons of options and layouts and makes it the perfect choice if you are looking to create the perfect video website. If you plan to do a video blog, video tutorial website, podcasts or any other video related content – surely Onevideo is just a thing of beauty. Onevideo Video & Sharing WordPress Theme comes with unlimited colors (choose your own branding, logo, logo size, etc), unlimited fonts (we have included the full Google fonts library) and custom fonts (upload your own fonts to make your website even more exclusive) and a beautiful icon library for you to choose from. The mega menu option is also available so you can show videos from categories directly in the menu, add multiple columns to your menu and arrange it the way you want it. Even icons are an option available, so you have more than enough customization for the menu. With Onevideo Video WordPress Theme we are bringing sticky sidebars option to the user, so now you can just make them stick on scroll so your users always get a sidebar. Wherever they scroll they have a sticky sidebar and even a sticky video option available. If your user scrolls below the video content, your video player will be shown on the left-top corner in a smaller version, just to make sure you are not missing anything even if you are scrolling away. Subscriber only video posts have been on our radar for a while now, and with Onevideo we have achieved that. You can now just activate the option from your Dashboard and use any subscription plugin out there. Your viewers can be deligthed with 2 different single video layout styles, both with left or right sidebar options just to make sure you get the most of your content. Custom widgets are also available in the theme, as we provide custom Instagram, Twitter, Most shared, Most Viewed and most liked widget for the posts and custom posts options available in the theme. Let’s not forget that Onevideo Video WordPress Theme comes with a built-in contact form with custom fields available for add.